Let me tell you how to make a really awesome dinner that your husband/wife/significant other/roommate/self will love. Well, if he/she/they/you like cheese. And bacon. But if he/she/you/they/you DON’T like cheese or bacon, you’re pretty much reading the wrong blog here, kids. 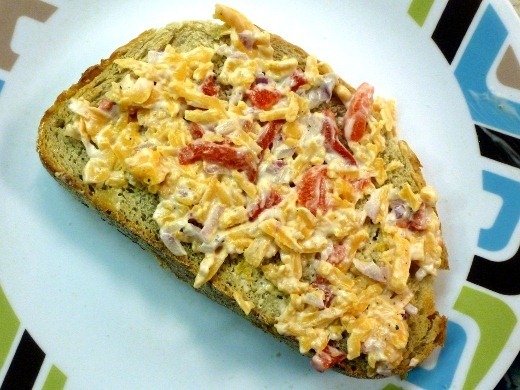 So cutting to the chase, pimiento cheese is pretty awesome right? You’ve had it? I’ve had it a few times in my life, and most recently, purchased an 8 ounce tub of it from Zingerman’s Creamery in Ann Arbor. If you haven’t had it, just trust me, it’s well, pretty awesome. The idea of making my own pimiento cheese was pretty enticing because well, (1) the stuff is delicious, (2) the good stuff is not cheap to buy pre-made, (3) I love homemade foods. 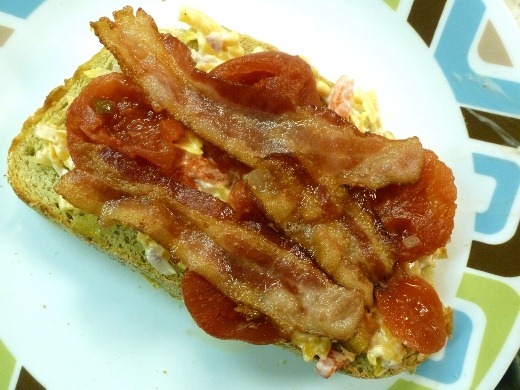 I saw a recipe for “Open-Faced Pimiento Cheese BLTs” on the Cooking Light website and knew it looked like a winner. First, I made the homemade pimiento cheese out of seven ingredients: grated reduced-fat sharp cheddar, red onion (I subbed this for shallots), mayo, bottled pimientos, cider vinegar, black pepper, and parmesan cheese. Actually to be honest, I completely forgot the grated fresh parmesan cheese and the cheese was still awesome without it. I slathered the cheese mixture upon a piece of crusty toasted sourdough bread, fresh from the bakery, and placed tomato slices atop the cheese. And to top it off, a handful of arugula. And there you go! Extremely flavorful and hearty enough to serve as a main dish, this Open-Faced Pimiento Cheese BLT was raved about by the huz. And with good reason! It was seriously pretty awesome. My roasted brussels sprouts on the side got a tad crispier than desired, however. 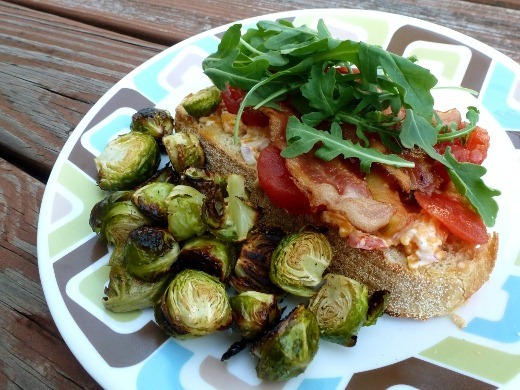 Serving the sandwich open-faced saves lots of calories with sacrificing any flavor. 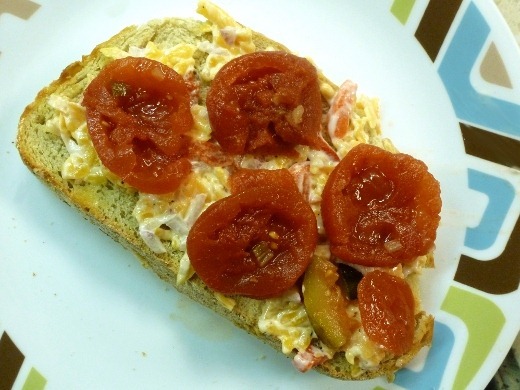 I did end up having a second open-faced sandwich, because, dang, it was good stuff. 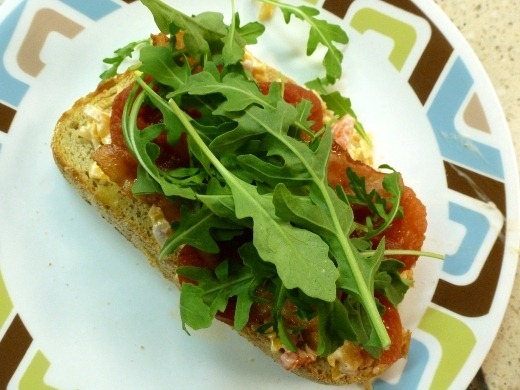 Cooking Light indicates that each open-faced sandwich has around 266 calories. I was a tad generous on the bacon portions and on the bread thickness, so mine may have been a tad higher in the calorie department. Currently listening to: Erase My Scars – Evans Blue. Pingback: Lack of Pimientos « Meg.Goes.Nom.Nom. Pingback: Meal Planning for Week of August 25-31 « Meg.Goes.Nom.Nom.